Ending Soon: Princess Cruises 3-For-All Sale! 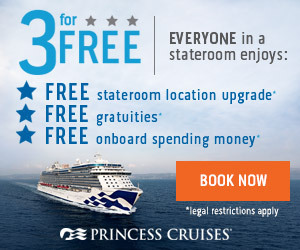 Just wanted to send a quick note that the Princess Cruises 3-For-Free sale is expiring Thursday night! If you have been considering a Princess Cruise, now is a great time to book! Hurry, there's still time to take advantage of this incredible offer – and don't forget, all guests in a stateroom can enjoy this deal! There's something for everyone, since all destinations are on sale, from Summer 2018 - Spring 2019. And refundable deposits are just $100 per person!